CANALIA Hand-Painted Canalware is the website of Anne Nichols, who paints traditionally decorated items in a variety of shapes and materials. 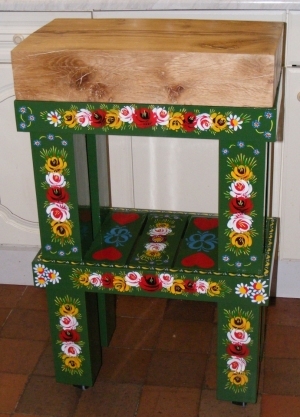 All items produced are hand-painted by Anne using lead-free paints. The designs used are those found on the boats of the inland waterways network of the UK, and which began in the 1800s with the trade carriers and owner-boatmen of the day. I rarely paint identical items, so please bear that in mind if you are seeking sets or matching pairs. I paint items from the size of thimbles to butcher's block tables such as that shown on the right, made by Have a Heart Designs of Kirkby Stephen. I do accept occasional commissions, depending on my workload at the time, so feel free to enquire if you are seeking something special. You can buy my work from my Folksy shop.